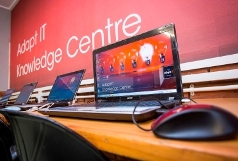 Adapt IT, a growing and innovative IT Company, launched their first Knowledge Centre on 21 May 2013. The centre will serve as a computer lab for the more than 1400 children and 45 educators of the Zwakele Primary School in Amaoti, the largest informal settlement in Kwa-Zulu Natal with a population of more than 80,000. The initiative is a joint venture between Adapt IT, Angel Projects (a social investment agency), Africa Learn (a training company) and the Department of Education. 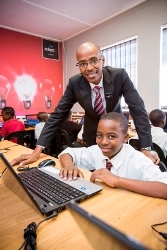 “The opening of the computer lab forms an integral part of our social investment drive and will support long-term community development by encouraging the youth to embrace technology and give them the necessary skills to contribute to the ICT sector,” said Adapt IT CEO, Sbu Shabalala, CEO. The state of the art computer and internet training facility, funded by Adapt IT, comprises of 50 computers, all installed with the necessary software and internet connections. In the centre learners will have access to quality IT training. In order to ensure a conducive and learner friendly environment, the classroom was repainted and refurnished with new blinds, desks and chairs. An interactive white board, printer and air-conditioning system were also installed. “As part of our social responsibility, it is important for us to ensure a comprehensive and sustainable training programme is in place for both the educator and learner. Africa Learn was contracted to oversee all training and it will include an onsite facilitator for a period of six months. All courses will be personalised to meet the needs of the school and will allow for maximum flexibility. The course for the teachers will run over a period of six months, empowering them to provide the necessary IT training to the children,” said Shabalala. Angel Projects were managing the project to ensure sustainability of the lab into the future. “It was a privilege to work on this project with Adapt IT and we look forward to installing more of these labs,” said Brenda Scheepers, owner of Angel Projects. School Principal, Sam Makhanya expressed his sincere appreciation for the new computer lab and said he is excited about the quality of learning it will offer, all in a space dedicated to the children. “We are planning to install more computer labs in future and will be using Zwakele Primary as a blueprint for future initiatives,” said Shabalala. He also thanked all the partners for their contribution and commitment in making this initiative a reality. The Adapt IT group has over 350 staff throughout SA with customers across SA, Sub-Saharan Africa, Australasia, USA and Europe. It provides a range of specialised IT solutions and services to customers in a number of sectors, including manufacturing, mining, education and financial services.